The climate consensus is created and maintained by cutting off funding to any scientist who tells the truth about climate. 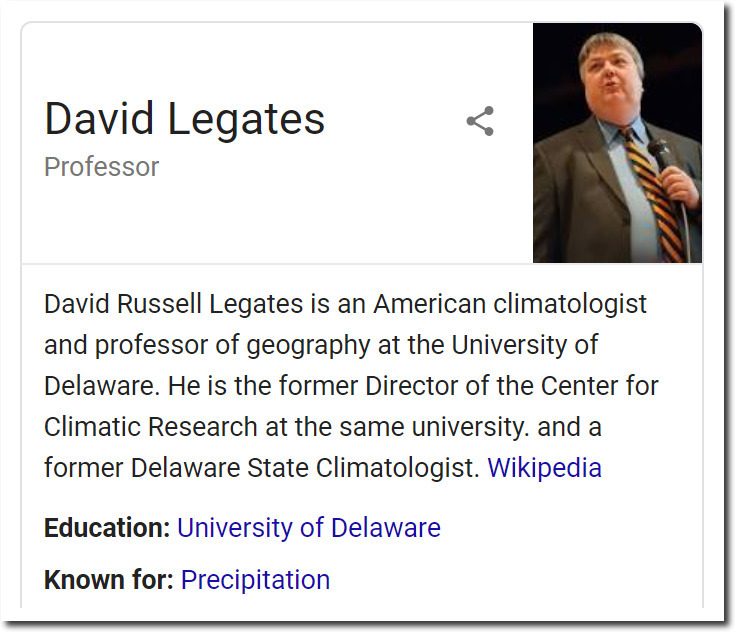 Like Bill Gray at CSU or David Legates at The University of Delaware – formerly the Delaware State Climatologist. Everyone in climate science understands this, so they keep their mouths closed. About a decade or more ago, I was told by someone that I had been placed on a federal “Do Not Fund” list. Undaunted, I applied for a grant from NASA. Well, the proposal was rejected but the letter back from NASA contained only a single review sheet that was blank except for the following note written in the comments section: “NCDC [National Climatic Data Center in Asheville NC] should be funded to do this research.” When I contacted the program officer, Jared Entin, he indicated that he was on vacation but would investigate right away. I have called and e-mailed; I have yet to hear back from him. Several years later, I applied to the USDA to leverage weather radar to enhance agricultural forecasting. My proposal was submitted electronically and was listed as “Under Review”. In due course, I received a note from the USDA that all proposals had been either rejected or accepted and they thanked me for my submission. Since I had not heard from them, I went on-line and checked my proposal. It was listed as “Under Review”. I sent an e-mail to the program officer and one of his assistants responded. She seemed so friendly and helpful and wanted to know more about the proposal that I had submitted. When I gave her the proposal ID number, I received a terse reply: “You will have to take this up with the Program Officer”. So, I did. We played the same game again — he then stopped answering e-mails or phone calls. Eventually, I got the University Research Office to inquire. They said they were told by the Program Officer that “we cannot be responsible for system problems.” Sure…right. I have submitted a total of 5 federal grants since I was told. All five have met the same fate. No bad reviews…no reviews at all. And the Program Officer cuts off all communications. ← Climatism vs. Eugenics: Which is Worse?